After you try this Rum Cosmo you’ll never go back to the original. While criss-crossing the country extolling the many virtues of Rum we often incorporate cocktails into our seminars. In order to demonstrate the incredible versatility of Rum we have given a Rum make-over to a handful of classic cocktails that everyone knows and loves. The Cosmopolitan is one of these cocktails. Rum, as well as any spirit and better than most, marries beautifully with fresh fruit juices. The Cosmo offers the perfect stage for Rum to demonstrate its affinity with fruit juice. 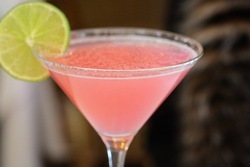 Our Rum Cosmo is always a hit. It’s fun for us to watch the faces in the crowd go from slightly skeptical to thrilled in a matter of a sip. Try it – you’ll never go back to the original. In a cocktail shaker add the Rum, orange liqueur, cranberry juice, and lime juice. Top with cubed ice and shake vigorously for 10 seconds. Strain into a chilled cocktail glass. Add a lime wheel or lime wedge for a tart addition or an orange for a slightly sweeter take.